This 2003 release contains 13 tracks: 8 original tracks and 5 remixes. This album is a fantastic blend of 18th century classical instrumentation layered with 21st century synthetic programming. Phantom of the Opera style pipe organs with modern keyboards and drum beats create an atmosphere of Old European meets Cylon Frankenstein. This CD portrays classic gothic song righting of loss and tragedy. Accented by by the dramatic style singing. 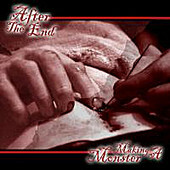 "Making a Monster" contains both inspirational clove-smoking background music and few club-worthy tracks, such as "Cukoo Clock", "Making a Monster" and "Open Arms Empty". This album is recommended for fans of the atmospheric MIDNIGHT SYNDICATE, soundscapes of Nosferatu, or to fans of Diary of Dreams for the darkwave dance aspects.